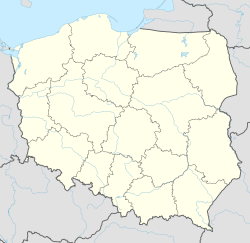 Solec Kujawski [ˈsɔlɛt͡s kuˈjafskʲi] (German: Schulitz) is a town with 15,505 inhabitants and an area of 176 km², situated 14 kilometres southeast of Bydgoszcz in Poland at 53°4′N 18°14′E﻿ / ﻿53.067°N 18.233°E﻿ / 53.067; 18.233. Solec Kujawski belongs to the Kuyavian-Pomeranian Voivodeship. The town features Saint Stanislaus in its coat of arms. During the German Invasion of Poland in 1939, Wehrmacht soldiers and local German minority members murdered 44 people from the town on 14 September. Some of the victims were brutally beaten with rifles (up to the point that they broke apart). South of Solec Kujawski there is the longwave-transmitter Solec Kujawski. This Bydgoszcz County location article is a stub. You can help Wikipedia by expanding it.